Sitting waiting in an empty Charlie’s Bar on a steamy summer’s day for an old colleague to appear, who as it turned out had forgotten about our meeting. What to do. Charlie’s Bar has been serving quality draught ales primarily from the UK in central Copenhagen for as long as I can remember. Feeling rather neglected, I turned to the bar’s owner and fellow countryman, Iain Russell, if by any chance they had Ruddles on tap. Iain looked surprised because the previous day he had received a couple of barrels of this prime quality and unknown ale originally from the heart of England, Rutland. As a teenager growing up in Nottingham, learning my way around the ale chart, Ruddles was always my first choice. So 30 years later, sitting in this authentic bar with a pint of this fruity ale before me, it’s distinctive aroma brought back wonderful memories and with tears swelling confirming the power of taste. Charlie’s Bar has been a worthy pioneer of providing Copenhagen’s thirsty locals and visitors to the Danish capital with a variety of beers produced by independent breweries. 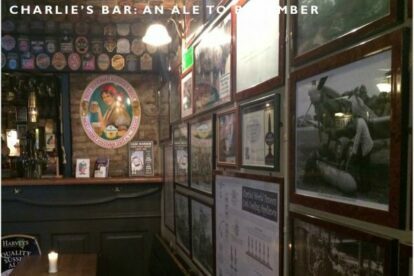 Visit this unique bar, taste your ale from every corner of the UK and discover your own memories.